Sit Kwin, Myanmar: The Muslims of Sit Kwin were always a small group who numbered no more than 100 of the village’s 2,000 people. But as sectarian violence led by Buddhist mobs spreads across central Myanmar, they and many other Muslims are disappearing. Their homes, shops and mosques destroyed, some end up in refugee camps or hide in the homes of friends or relatives. Dozens have been killed. Since 42 people were killed in violence that erupted in Meikhtila town on March 20, unrest led by hardline Buddhists has spread to at least 10 other towns and villages in central Myanmar, with the latest incidents only about a two-hour drive from the commercial capital, Yangon. The crowds are fired up by anti-Muslim rhetoric spread over the internet and by word of mouth from monks preaching a movement known as “969”. The three numbers refer to various attributes of the Buddha, his teachings and the monkhood. But it has come to represent a radical form of anti-Islamic nationalism which urges Buddhists to boycott Muslim-run shops and services. Myanmar is predominantly Buddhist but about 5 percent of its 60 million people are Muslims. There are large Muslim communities in Yangon, Mandalay and towns across Myanmar’s heartland where the religions have co-existed for generations. But as violence spreads from village to village, the unleashing of ethnic hatred, suppressed during 49 years of military rule that ended in March 2011, is challenging the reformist government of one of Asia’s most ethnically diverse countries. Dusk-to-dawn curfews are in effect in many areas of Bago, the region where Sit Kwin lies, while four townships in central Myanmar are under a state of emergency imposed last week. “I will not hesitate to use force as a last resort to protect the lives and safeguard the property of the general public,” President Thein Sein said in a nationally televised speech on Thursday, warning “political opportunists and religious extremists” against instigating further violence. The unrest has made almost 13,000 people homeless, according to the United Nations. State-run media reports 68 people have been arrested. The trouble in Sit Kwin began four days ago when people riding 30 motorbikes drove through town urging villagers to expel Muslim residents, said witnesses. 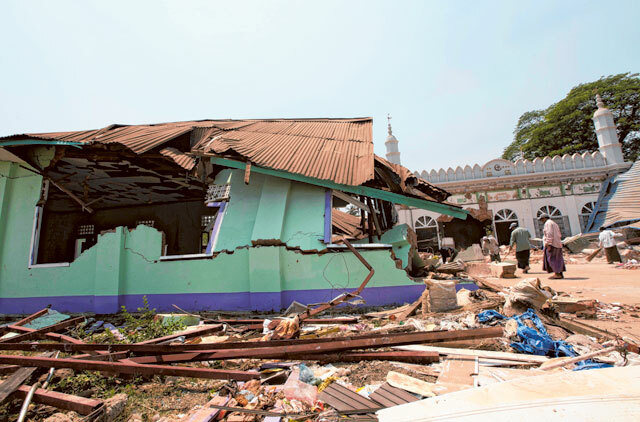 They then trashed a mosque and a row of Muslim shops and houses. “They came with anger that was born from rumours,” said one man who declined to be identified. Further south, police in Letpadan have stepped up patrols in the farming village of 22,000 people about 160km from Yangon. Three monks led a 30-strong group towards a mosque on Friday. Police dispersed the crowd, many of whom carried knives and staves, and briefly detained two people. They were later released at the request of township officials, police said. The abbot who led the protest, Khamainda, said he took to the streets after hearing rumours passed by other monks by telephone, about violence between Buddhists and Muslims in other towns. He said he wanted revenge against Muslims for the destruction by the Taliban of Buddhist statues in Bamiyan province in Afghanistan in 2001. Across the street, Hla Tan, a 67-year-old Buddhist, shares the fear. “We have lived peacefully for years. Nothing can happen between us unless outsiders come. But if they come, I know we can’t stop them,” he said. North of Sit Kwin, the farming town of Minhla endured about three hours of violence on both Wednesday and Thursday. About 300 people, many from the nearby village of Ye Kyaw, gathered on Wednesday afternoon. The crowd swelled to about 800 as townsfolk joined, a Minhla policeman told Reuters. They then destroyed three mosques and 17 shops and houses, he said. No Buddhist monks were involved, said witnesses. The mob carried sticks, metal pipes and hammers, said Hla Soe, 60, a Buddhist who runs an electrical repair shop in Minhla. “No one could stop them,” he said. About 200 soldiers and police eventually intervened to restore a fragile peace. “I’m very nervous that it will happen again,” he said. About 500 of Minhla’s township’s 100,000 people are Muslims, said the police officer, who estimated two-thirds of those Muslims had fled. However, Tun Tun is staying. “I have no choice,” says the 26-year-old, whose tea shop was destroyed and looted by Buddhists, one armed with a chainsaw. He plans to rebuild his shop, whose daily income of 10,000 kyat (Dh40) supports an extended family of 12. On the wall of his ransacked kitchen is a portrait of democracy leader Aung San Suu Kyi. He did not believe she could do anything to help. Tun Tun traced the rising communal tension in Minhla to speeches given on February 26 and 27 by a celebrated monk visiting from Mon State, to the east of Yangon. He spoke to a crowd of 2,000 about the “969 movement”, said Win Myint, 59, who runs a Buddhist community centre which hosted the monk. After the 969 talks, Muslims were jeered and fewer Buddhists frequented his tea shop, said Tun Tun. Stickers bearing pastel hues overlaid with the numerals 969 appeared on non-Muslim street stalls across Minhla. President Thein Sein’s ambitious reform programme has won praise, but his government has also been criticised for failing to stem violence last year in Rakhine State in western Myanmar, where officials say 110 people were killed and 120,000 were left homeless, most of them Rohingya Muslims. The UN special rapporteur on human rights in Myanmar said on Thursday he had received reports of “state involvement” in the recent violence at Meikhtila. Ye Htut, a presidential spokesman and deputy minister of information, called those accusations “groundless”. “In fact, the military and the government could not be concerned more about this situation,” he said in a Facebook post. Late on Friday, three monks were preparing to give another “969” speech in Ok Kan, a town 113km from Yangon.